. : Optics & Photonics Focus :: Neurons, Freeze! :. Day-to-day life common sense often does not apply in science. But sometimes it works better than any other approach. Scouts know that retracing back clear markers on the way can avoid getting lost, the same principle has been recently proved to work in nanoplasmonics. Neurons are the building block of the arguably most complex structure of the Universe: the human brain. Recent experiments show innovative ways to shock-freeze neurons while they are communicating with each other. Reconstruction of a synapse. A 3D representation of the presynaptic neuron. The yellow spheres are the vesicles filled with neurotransmitter. The different types of filaments are in red and blue, the membranes of the presynaptic and postsynaptic neuron are in purple, and the synapse is in green. The postsynaptic neuron cotent is represented in dark yellow. Airplanes faster than sound, particles accelerated to almost the speed of light, entirely artificial tastes and flavors that delight our senses; all of these were conceived by the human brain, whose building blocks are the neurons. The interconnection and intercommunication between these remarkably simple cells creates arguably the most complex structure in the Universe. Surprisingly, however, the details of such communications are still not fully understood. New insights could now be possible by using a technique developed by researchers led by Vladan Lučić at the Max Planck Institute of Biochemistry in Martinsried near Munich, Germany: they succeeded in freezing the neuronal filaments involved in the regulation of the message emission without creating ice-crystals and, therefore, without altering their structure. Organisms are made of cells. In complex organisms like humans specialized cells take over specific functions and work together with other cells. Neurons are the cells constituting nerve fibers. They are responsible for transport and treatment of sensorial and motor information in our body. Neurons need to communicate information between each other and they do so in different ways. One example is the reaction between visual stimulus and muscular contraction, such as an escape reaction: "there’s a hungry lion, run away!" Neurons are also fundamental building blocks in our brain and thus are ultimately responsible for all forms of imagination and reasoning. The space where two neurons exchange information is called synapse. The sending presynaptic neuron releases neurotransmitter molecules that pass through the synaptic cleft and dock to the receptors on the receiving postsynaptic neuron. How neurons communicate. 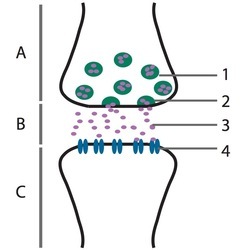 In the presynaptic neuron (A) vesicles filled with neurotransmitter molecules (1) fuse with the presynaptic neuron membrane (2) to release the neurotransmitter molecules (3). These pass through the synaptic cleft (B), also called active zone, and bind to the corresponding receptors (4) at the postsynaptic neuron (C). Typically, neurotransmitter molecules are contained in vesicles inside the presynaptic neuron. In order to send a signal to the adjacent neuron a complex process moves these vesicles towards the neuronal membrane. Then the vesicles' membrane and the neuron's membrane fuse and the neurotransmitter molecules are released into the synaptic cleft. This whole process is very fast and occurs within a few milliseconds. Of course, speed is crucial for transmitting potentially life-saving impulses. From a research point of view, however, this speed of transmission renders in depth analysis very difficult, which is why this process is still not completely understood. What researchers usually do in order to study the presynaptic neuron structure is to freeze the whole synaptic region with many neurons and then image the sample using a powerful microscope. Electron microscopes, in particular, provide high resolution images well beyond the capabilities of optical microscopes. By combining images taken from different angles with a technique known as electron tomography it is even possible to obtain a 3D image of the sample. Unfortunately, there is a big problem that arises when freezing the sample: water forms ice crystals and thus alters the neuronal structure. Worse still, ice crystals may even destroy the cellular structure or the components under investigation. In fact, water significantly expands during the formation of ice, which is why ice floats on water and also the reason why one should never place a completely full and sealed glass bottle into the refrigerator. The research team in Munich was able to come up with a solution to this problem which will allow a more accurate study of the neuronal structure. "The problems associated with ice crystals can be avoided by shock-freezing the sample," Lučić explains. His team froze the synaptic region using a novel technique called vitrification. A shock-frozen synapse. 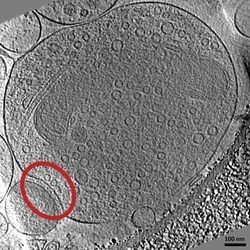 This image shows a synapse that passed though the vitrification process and was obtained by electron microscopy. It is one of the images used for the 3D reconstruction. In the red circle is a synapse, on the top is the presynaptic neuron with its neurotransmitter vesicles and on the bottom is the postsynaptic neuron. With this method of vitrification, the temperature drops so extremely fast that the water molecules have no time to expand into ice crystals. "When a very thin sample with a thickness of below one micron is quickly immersed in a liquid at about -170ºC," Lučić continues, "it naturally cools very quickly. Furthermore, it is necessary to use a liquid that allows the heat from the sample to dissipate very fast to cool of the sample quickly. This is the case with liquid ethane, but not with liquid nitrogen." There is one particular point of caution that Lučić points out when analyzing a sample, "the imaging process," Lučić points out, "can affect the sample, if the electron dose that one uses to illuminate the sample is too high. Therefore it is of utmost importance that the microscope operator spends as small a dose as possible at the region of interest, but still enough to obtain images of sufficient quality." In this way, Lučić's team was able to immobilize presynaptic neurons without any alterations due to the formation of ice, which brought them closer to the actual physiological configuration. They studied, in particular, the filaments connecting vesicles containing the neurotransmitter. "These filaments," Lučić explains, "are involved in the regulation of the synaptic release. Whenever a neuron has to release its vesicles, these filaments regulate their mobilization and facilitate the release of the neurotransmitter. Also, when there is no need to release the neurotransmitter, these filaments limits vesicle dispersion." "Lučić's experiment," Serge Marty from École Normale Supérieure in Paris, France, says, "enables us to distinguish real structures from artifacts." Conventional methods did allow for studies of the structure of the presynaptic neuron, but they could not rule out errors originating from ice crystals. "Other methods that are used to immobilize the presynaptic neuron," Marty continues, "also use freezing but they also dehydrate the sample causing some damage to the neuron's structure." Marty therefore sees this new method as an interesting complement to conventional methods that observe synapses in neurons without the need of the same protective substances. "At this point," Lučić adds, "we are very interested in the kind of molecules that constitute the different types of filaments. Also we would like to understand the relationship between the different types of filaments as well as their exact functions." Both scientists are confident that the understanding of many complex physiological processes will benefit from studies of vesicular dynamics. This understanding could even shed new light on the ever elusive and ever captivating question of how we actually think. MBPR is a research student working in neurophysiology at the National Autonomous University of Mexico (UNAM, México, D.F.). 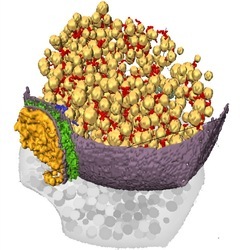 Rubén Fernández-Busnadiego, Benoît Zuber, Ulrike Elisabeth Maurer, Marek Cyrklaff, Wolfgang Baumeister & Vladan Lučić, Quantitative analysis of the native presynaptic cytomatrix by cryoelectron tomography, The Journal of Cell Biology (2009) 188, 145–156 (link).